In case you didn’t know, YouTube is one of the go-to sources for entrepreneurs to learn more about new ideas, tips and strategies to learn and grow their business. In this article, we will cover the top YouTube channels that we think every entrepreneur should subscribe to. As an entrepreneur, the desire to educate yourself on different methods and techniques means you have a higher chance to succeed by having the knowledge to make the right investments. But with the constant flow of new information, by the time a new book on entrepreneurship is published, it’s quite likely that the methods described will have become obsolete. Not only is the message in these books important, the way it’s presented and delivered has a big impact on how well and how fast you can learn and adapt these techniques to your career, that is, relying on just text may prevent the reader from fully understanding the concept described. Watching videos has become a favored way to learn. And for this reason, Youtube has become a reliable and highly updated source of information. Armed with both a strong message and visual components, Youtube videos and tutorials can help you understand some concepts which would otherwise be harder to get a grasp of in written form. We have put together a short list of Youtube channels we believe deliver the best value-packed content when it comes to entrepreneurship and offers practical tips on how to help you reach your full potential, how to learn, grow and scale your business. Some of these channels purely focus on business strategies and tactics. Others are a mixed between personal development, mindset, motivation and how to overcome challenges in business and in the life of an entrepreneur. Gary Vaynerchuk is an entrepreneur and 4 times New York Times bestseller author whose Youtube channel focuses mainly on what it’s like to be an investor, CEO, and public speaker. What truly sets apart this channel is how at ease Gary is on camera. His videos range from daily Vlogs filled with useful advice, all the way to recordings of some of his live events. During Vaynerchuk’s most watched segment, The #AskGaryVee Show, there is usually a high-profile guest, ready to share some of his or her tips to success, with some of the most notorious guests including John Legend, Tony Robbins, and Seth Godin. Apart from this segment, Vaynerchuk usually uploads a new video every single day focusing on different business and entrepreneurial tips. If you are looking for a fun and fresh way to not only be inspired to aspire to more, but also to learn more about the world of investment, don’t hesitate to check out Vaynerchuk’s channel! Visit Gary Vaynerchuk Channel here! Brian Tracy is an acclaimed author and motivational speaker, known for his fast-paced seminars and lectures. Tracy’s Youtube channel follows a more traditional and serious tone, offering its viewers short videos with a clear and straightforward message, although not commonly using animations or any other complimentary visual aids. Tracy’s most viewed videos are subdivided into playlists which feature short videos focusing on Personal Success Training, Sales Success Training, and Business Success Training. As you may have noticed, there’s a common denominator in all these playlists: training. At its core, Tracy’s channel focuses specifically on giving its viewers the necessary skills and knowledge to succeed not only in business, but also in life. If you want to get a closer look into Brian Tracy’s methods and theories on success, this is as close as you will get without leaving the comfort of your own home. Looking for a cut to the chase, one-on-one lesson with one of the top motivational speakers in the world? Then this is the channel to subscribe to! Visit Brian Tracy Channel here! Behind the Brand offers its viewers much more than just a deeper look into a single entrepreneur’s methods. In this channel, Bryan Elliott goes opens the doors to a huge array of different successful companies and business people. As a viewer, you have the unique opportunity to not only find an in-depth video featuring your area of interest or expertise, but also explore different companies, niches, and ideas. As expected, each episode features a different entrepreneur, celebrity, or artist who are willing to share some of their own personal experience with the “Behind the Brand” viewers. Some of the channel’s top viewed videos feature Jamie Oliver, Daymond John, Tony Hawk, and Gary Vaynerchuk. Behind the Brand offers you a very special opportunity as a viewer to learn how some of the most influential people in society have made it all the way to the top, while maintaining their own brand in mind. Although the videos are somewhat long, with some ranging all the way to 1 hour, every single second is as insightful and educational, as it is fun and entertaining to watch. Whether you want to know more about your favorite company, looking for tips to reach success, or just want to learn more about different business models, this is the channel for you! Visit Behind the Brand Channel here! Marie Forleo is is a life coach, motivational speaker, and author with one very clear goal: to help you start your business. And her channel truly reflects that, as her weekly videos offer insightful information and great ideas on how to help you use your full potential in order to start and develop your own brand. Her videos often feature other high-profile motivational speakers and celebrities such as Tony Robbins, Elizabeth Gilbert, and Susan Cain. On top of these one-on-one interviews where specific tips to success are discussed, Forleo also has several videos alone where she discussed her own business model and keys to success. Always funny, upbeat, and enthusiastic, Marie Forleo’s channel will make you laugh and learn every single week. This channel is ideal for those just starting their own company or business, or those looking to start fresh again. If you are looking for a high-quality yet highly entertaining way to get your head back in the game, Marie Forleo’s channel is the one to check out every single week. Visit Marie Forleo Channel here! Lewis Howes, former Arena League football player, entrepreneur, and author, first introduced the world to “The School of Greatness” through his podcast. Now, he is taking over Youtube with his inspiring and educational Youtube channel. Some of his most viewed videos include his own personal tips on how to market your products or advertise your company online. But more than just his own personal tips and thoughts also featured on the podcast “The School of Greatness”, Howes channel is a more in-depth look at the world of business. Often featuring known celebrities and entrepreneurs such as Tony Robbins, Daymond John, and Grant Cardone, the viewers can have a fuller knowledge and more exposure to different tips when it comes to business and personal life. For all long-time fans or casual listeners of his podcast, this channel is a must-watch. Although the videos are long and follow a basic podcast structure, you can definitely have access to more educational content and more tips than on the podcast. If you love his podcast, make sure to subscribe to Howe’s channel in order to get a broader idea and deeper knowledge on how to succeed. Visit Lewis Howes Channel here! Tom Bilyeu is no stranger to success. In 2014 his company Quest Nutrition was declared the second fastest growing company in North America. Now he is sharing his tips to success on Youtube. In this channel, you have a chance to know more about a particular theory: the Impact Theory. According to Bilyeu, this theory will keep you focused, hungry, and ready to succeed. Perhaps this is the channel on this list which makes the best use of image and video, which aimed with his message and tips, truly make this channel an essential for every entrepreneur. Once again, there are usually guests on his channel willing to share some of their own expertise. Always interested, and eager to learn more, Bilyeu’s abilities as a host guarantee that each video is filled with useful and practical tips that can be applied to your own career. If you appreciate good cinematography value, a powerful message, and energy-filled lectures, make sure to subscribe to Bilyeu’s channel. Visit The Impact Theory Channel here! Evan Carmichael is a self-made entrepreneur, business consultant, and author, whose Youtube channel focuses on how to channel your energy and talent in order to become a better businessperson. His methods rely on helping its viewers follow their dreams and passions rather than focusing on money. One of the channel’s top viewed segments is the “10 rules”, where famous celebrities, entrepreneurs, and artists share their top 10 rules to achieve success. Amongst people who have been featured on this segment, you can find Will Smith, Ciara, and Tony Robbins. The channel also offers a wide variety of helpful playlists which feature short yet straight to the point videos. If you are looking for quick tips that can be quickly adapted to you and your life, look no further. Each video is educational, funny, and insightful! If you want to get helpful tips from the celebrities you admire, subscribing to Carmichael’s channel is the perfect way to do so. Visit Evan Carmichael Channel here! Valuetainment is a channel that, just as the name suggests, is focused on both value and entertainment. The channel, founded by Patrick Bet-David uses 2 main tools to get its message out into the world: Motivation, “How to” videos, and “Case Studies”. Starting off with the Motivation section, it’s the perfect way to get you ready and pumped to start working. The team uploads a Motivation video every Monday, whose aim is to not only inspire you to achieve more, but also offer you some sort of comedy relief. The next segment, the “How to” videos, focus on specific skills every entrepreneur should have. These are not only incredibly useful, they are also easily applied to both your personal life and career. The last segment, and perhaps the most notorious, are the “Case Studies”. In this playlist, you can find in-depth analysis of some of the top companies in the world, which of course you can use as your own inspiration. If you are looking for something to keep you on the track towards success, this is the channel for you. Valuetainment doesn’t just rely on entertainment to get subscribers, it absolutely delivers when it comes to teaching its viewers how to reach their full potential. By now, every entrepreneur should know who Grant Cardone is. This household name is an author, sales training expert, and the founder and CEO of 3 multimillion dollar companies. With several books and live events available, Cardone decided to go one step further and reach a whole new audience with his Youtube channel. Although there’s a huge diversity of videos in this channel, the big value of this channel resides on Cardone’s own experience as a sales training expert. There are several videos showing the correct steps to take when closing a deal, as well as several tapings of his live events where he offers valuable tips regarding sales. You can also find much more than just sales tips on his channel, as there are also several videos depicting Cardone’s daily life and even tips on real estate investing. If you are looking for a way to improve your sales, becoming a better businessperson, or just want to get a better look into Cardone’s life, don’t hesitate to click that subscribe button! Visit Grant Cardone Channel here! Chase Jarvis is a renowned photographer, artist, and entrepreneur who is best known for his app Best Camera. Best Camera was the first app to allow users to share pictures directly on social media. On top of that, Jarvis is the creator and CEO of CreativeLive, a free online educational platform. His Youtube channel is quite different from all the other ones on this list, and can be seen more as an educational tool for those within the world of Art. Ranging from daily videos made to sprout your creative, to Vlogs and behind the scenes footage, this channel is the perfect source of motivation for every artist. One of his most popular segments, “The 30 days of Genius Interview” was a highly praised segment where, for 30 days, high profile artists or entrepreneurs such as Gary Vaynerchuk or Brene Brown were interviewed, giving the subscriber the unique opportunity to get some great tips from some of the greatest entrepreneurs in the world. If you want to fill your work with creativity and inspiration, this is the channel to follow! With several videos teaching you how to unlock and use your creativity to your advantage, your career and personal life will surely benefit from just this simple subscription click. Visit Chase Jarvis Channel here! Directly from the contributors of Entrepreneur Magazine and Entrepreneur Network, now you can enjoy some of the best tips in these magazines with just one click! The highly popular channel offers several cartoon-like videos to better illustrate the steps necessary to become successful. Some of its most popular videos in this section include “How to really become a millionaire”, and “How to start a business in 10 days”. While other channels may use catchy titles like these as click bait, Entrepreneur truly gives you the tools and knowledge necessary in order to help you and your business grow. But the channel is so much more than just cartoons! It also features several interviews or one-on-one tips with the Magazine’s contributors. If you are looking for real-life tips and step-by-step tutorials to help you succeed, this is the channel to subscribe to. The short tutorials make it quite easy to envision and apply your own desires and goals into reality. Nowadays, Startups are all around us. Anyone with a good idea and business plan is willing to try to make their ideas and dreams come to fruition. And that’s why Startup Grind was created! The company is a network of entrepreneurs whose goal is to inspire, educate, and unite entrepreneurs all over the world. With meetings and conventions happening all around the globe, tappings of live events and talks for each meeting is uploaded onto the channel. Without having to leave your own couch, you could be watching and learning about different topics and companies presenting their work at the events in Los Angeles, Utah, or even Bangalore. Startup Grind completely erases borders and time restraints and allows all its viewers to learn more about entrepreneurship, regarding on their location. If you want to know more about the current entrepreneur ventures in the world, want to connect with other entrepreneurs, or just wish to further educate yourself on a specific topic, at Startup Grind you will find all this and much more. Visit Startup Grind Channel here! 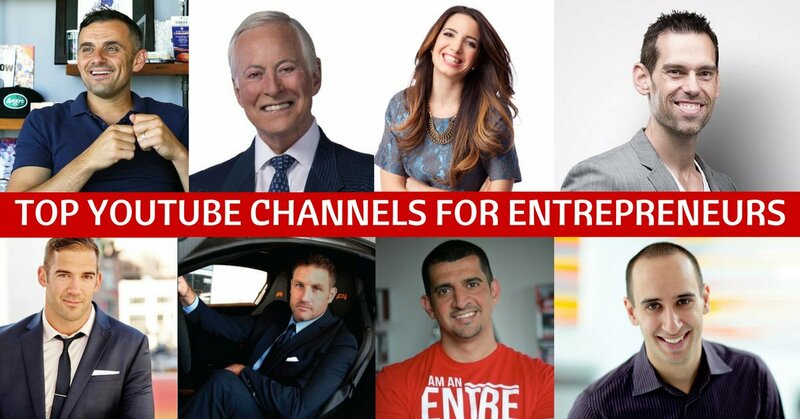 These were just some of our top Youtube Channels for Entrepreneurs. As a businessperson and entrepreneur, knowledge and passion is key. By using such simple platforms as Youtube to further learn, you are making a major yet simple time investment in yourself and your career. Hope you enjoyed our list and ended up finding your next source of education and inspiration.